This is the first of two posts on two new features in Excel 2010: sparklines and the slicer. I will discuss the slicer in the second post. 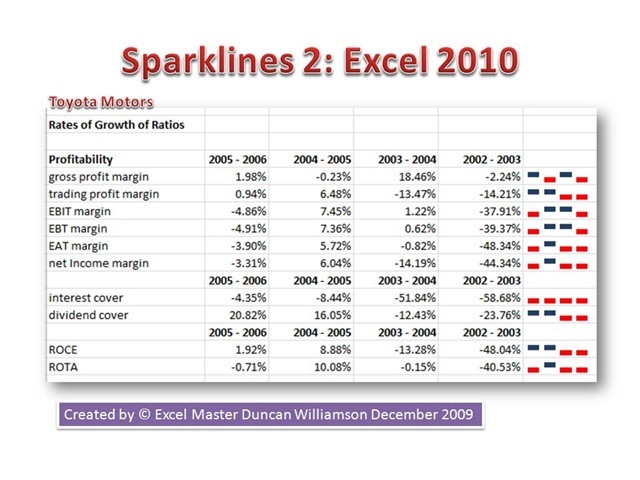 Sparklines are graphs or charts that are contained in one cell in a work sheet. this means that you can generate a range of data in one cell, two cells, lots of cells and create a sparkline graph in just one cell. They can be really effective as you can see below with the two screenshots I have taken of a workbook I ahve been working on in Excel 2010. There is a problem with sparklines and that concerns that vertical scale. In the example I am showing here, there is a range of data on the vertical scale of around 70 percentage points. By default it seems that Excel 2010 sets the vertical scale in the same way that data bars do in conditional formatting. What this means is that you might feel the need to set the lower limit of the vertical scale manually … in my example that makes the lines more flat than anything and that hides some of the message. To generate a sparkline, select Insert, Sparkines and then line or column or win/loss. You will then be prompted to select the range of the data and where you want the sparkline to be places. Simple! If you want to see a full size version of these screenshots, write to me at info@excelmaster.co.uk and tell me what you’d like me to send you … please be specific and say sparklines please or something similar.